I followed the lead of the Audiophile who reviewed these 8 years ago. I got a pair from a thrift store for 26 dollars 3 months ago. They are a great bargain already at that price. Then I read the review on this website that described the radical sonic improvement in these speakers when the capacitors in the crossover network are replaced with Jantzen Z- Standard Capacitors. I did the upgrade, and the change in the sound of these speakers is absolutely like night and day! They may actually be my best pair now. I have an 11.6 Home Theater System, and it is no slouch anyway. This upgrade made it even better. These Monitor 40 speakers are replacing a pair of Monitor 30 speakers I have been using for about 3 years. Normally I would not have bothered but picked these Monitor 40 speakers up for an unbelievable price still new in the box from a seller who won them and did not have any use for them. Well let me tell you WHAT A DIFFERENCE. The highs are still pure and clean like my Monitor 30 speakers but there is much more bass. Probably 3 times more. 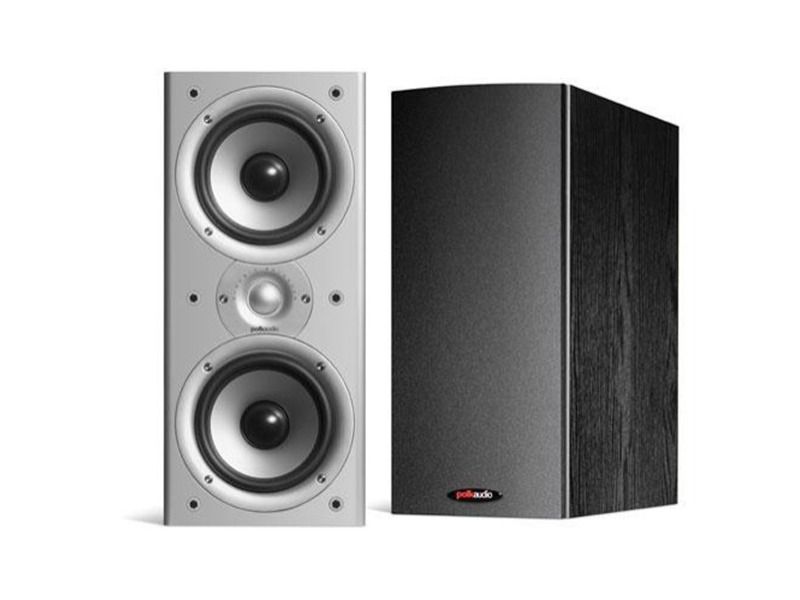 The monitor 40 speakers are about the same width, slightly deeper and almost twice as tall as the Monitor 30 speakers. I am using them as front speakers on a two speaker stereo system. The Monitor 40 speakers are easy to listen to and a real pleasure. I highly recommend them. Polk Audio really knows their stuff. I bought speakers used, they aparently have been discontinued but replaced by the TSi200. Ive compared the two and it appears the latest model has slightly more wattage, no aparent change in sound quality, both are excellent. Only difference is asthetics, so if you can land these used you can save a hundred dollars or so over the TSi200. It has a Very rich sound. Crisp trebble, and warm, abundant mid-bass. It is a large bookshelf, and has a tone that is normally found only on tower speakers. The shape and color is very handsome looking on the left and right side of a HDTV. This pair can serve as very formidable mains when matched with a good sub. The better the sub, the less crossover freq you have to dedicate to the Monitor 40's, the tighter your highs will be. I personally have them matched with a Klipsch Sub 12and this trio can stand up to the Monitor 70's any day of the week! Just got them a week ago.They sounded okay but was lacking some bass.Naturally,I opened them up,pulled out the crossover and said "DAMMIT". Again, K-Mart cheap Chinese electrolytic capacitors..no wonder ! Well,out they went and immediately in went Jantzen Z-Standard poly caps. Much better,definitely more bass,solid midrange where vocals excell,and the tweeter is much cleaner sounding. I'm starting to really like these speakers a lot since I swapped out the capacitors.Thats all i did on this set and it made a good 40% improvement thats not placebo.My 45 year old ears still work. Now I have $900.00 sound for $150.00(speakers) + 35.00(Jantzen Z-Standard caps). for $175.00 investment. You may not consider this review fair since the crossovers had a parts swap.Still,in stock form for $150.00 it is a bargain and a nice solid speaker.These were purchased at Newegg.com and shipping was free so get'em while you can. Honestly, I have no right to complain about these speakers and their low end parts...after all these are low end speakers rwith small 5 1/4" drivers .Driven by decent amplification and a good source I doubt you'll be dissapointed.These are a bargain and provide plenty of sound for an apartment or a small living room. Great price, superb quality at this price point! Seem to work incredibly well as surrounds. So I bought these to use as rear surround speakers and was immediately impressed with the level of detail that these speakers produce for being mid-fi. They really work well for surrounds delivering a superb amount of clarity and presence that make them disappear. I am powering them with a NAD C372 amplifier, which seems to be a good combination. somewhat big for bookshelf speakers, they are pretty deep. Great set of speakers. Especially for the price. Highs are crisp and clear without being too bright, and the range is surprisingly broad thanks to the dual drivers. If you like bass, pair them up with a Polk PSW12 or PSW10. They are a great match. I use these as fronts, matched w/ the PSW12, CS1 center, and M10 rears, I couldn't be happier. I replaced my Bose AM5 system with Polk, and I am so glad I did. I am hearing things in my music that I nevPolk does a great job with making speakers that sound equally as good with movies or music. For $150 for the pair on sale at CC, I cant recomend these babies highly enough.